There are numerous threads you can find all over the internet telling you how to migrate passwords from Google Chrome browser to firefox or simply exporting them to CSV and reusing them elsewhere. For me I recently switched my Google Accounts and it has been nothing but painful to move the cloud synced settings in chrome. Change the option to "enabled" from "default"
Relaunch the browser as needed. Export the current list, to download the current passwords, and keep this in safe place. 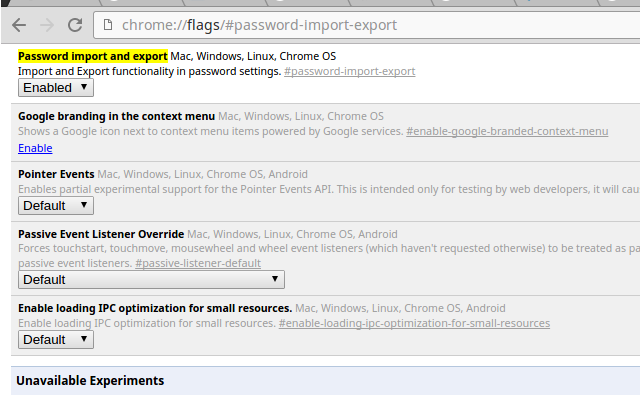 To add more passwords just create a new CSV with same format (i.e "Name", "URL", "Username", "Password") just import. It can take a while for the imported passwords to show up (CSV parsing for some reason takes time) Once that is done the passwords will show up. As the time of writing, I am on Chrome Version 52.0.2743.116 (64-bit). This feature is slow, and in beta. Do not blame me if you lose your passwords. Save the current password list at all costs. Pro Tip: keep the chrome running for a couple of hours, and will sync this with the cloud and these passwords will then be available everywhere. Restart to see if your account lost sync. Restart and re-login if needed. It took me a couple of tries to get this right.